An exhaustive compendium by Critical Review author Peter Wallison. In the aftermath of the crisis, it is customary to fault the markets: Markets missed the crisis; markets are euphoric in good times; markets suffer from mob mania; markets reflect animal spirits, and so on. It is tempting to ring the death knell of “efficient markets”: How could creditors get it so wrong? Why did bank shareholders not react sooner? Can we rely on markets any longer? I contend that markets have been reasonably efficient, but only within poor regulatory constraints. Markets slept in the buildup to this crisis when regulation was supposed to be on the watch. It was lax regulation – not markets – that let us down. And until we improve the regulatory perimeter within which markets operate, we will not be able to generate stable economic growth. Most of the leverage built by financial firms between 2004 and 2007 was either done through regulatory arbitrage or was the result of lax regulation. Commercial banks added over $700bln to their off-balance sheet leverage by providing under-capitalized guarantees to structured purpose vehicles (“conduits”) that themselves had hardly any capital. Regulators allowed this, even though a similar leverage game brought down Enron. Once the Securities Exchange Commission (SEC) lifted their “net capitalization rule” in 2004, investment banks ramped up their exposure to sub-prime mortgages. In no time, these banks drove up their debt-to-equity ratios from 22:1 to 33:1. A.I.G. was the mother of all jurisdictional arbitrages. It bought a small thrift in order to get its several hundred billion dollars of credit default swaps weakly capitalized, avoiding the New York State Insurance Department, its natural but tougher regulator. Banks buying protection from A.I.G. could not care less as they too got a regulatory capital relief in the process. And regulators allowed Fannie and Freddie – set up by the government to securitize prime mortgages – to bet in sub-prime assets that eventually ruined them. Markets could be deemed inefficient in all this if they had the relevant information, but made a mistake in not using it. But many activities through which the financial sector built up leverage, such as conduits and over-the-counter exposures, were not visible to investors. In contrast, these activities were – or should have been – visible to regulators. Elsewhere, it was simply not in the interest of investors to be bothered. For instance, Fannie and Freddie’s debt was understood by all to be government-backed, so their sub-prime bets were a pure gambling option for the shareholders. And except for a few cases, even uninsured creditors and counterparties of failed financial institutions have walked away without taking substantial haircuts. The low price of credit risk of financials until 2007, coinciding with a rising path of their leverage, implied that the hidden trajectory of expected taxpayer losses was exploding. Put simply, profits were being privatized and risks socialized. It was regulation, not markets, that allowed this to happen. Regulation is supposed to fix market failures. But regulation also reduces market discipline. For instance, insured depositors are unlikely to “run” but they also freely deposit at the highest-yielding bank, not worrying about its credit risk. Thus, when regulators deem a bank as well-capitalized, the onus is on regulators that this be right. Markets may not have the incentive to gather this information nor possess the details of regulatory supervision that led to such an assessment. Conversely, when regulation allows itself to be arbitraged, the financial sector becomes more opaque exposing markets to unexpected outcomes. When such adverse outcomes materialized in the first eight months of 2007, market learned fairly quickly. By then, Countrywide had fallen, Bear Stearns had to bail out hedge funds invested in the US subprime assets, and indices tracking such assets were declining day by day. When BNP Paribas declared on August 8th that there was no market for subprime assets in its hedge funds, it became clear to investors that the entire financial sector had made a one-way bet on the economy. Investors realized that the seemingly well-capitalized financial institutions were in fact significantly more levered, no matter what their regulatory capitals looked like. Since that day of rude awakening, markets have given hell to the weak players and rewarded the strong ones. Financials with the worst balance sheets have fallen, and the next in line have been punished severely. Bear Stearns failed in March 2008 even as its regulatory capital level exceeded 10%, well above the required minimum. It was clear to markets that Bear’s regulatory capitalization had little information content about its solvency. In fact, only the relatively stringent “stress tests” conducted earlier this year have restored markets’ confidence in regulatory endorsements of financial stability. Alan Greenspan, the former Federal Reserve Chairman, acknowledged that he “made a mistake” in trusting that free markets could regulate themselves. The underlying assumption is itself questionable. The financial sector – so heavily regulated and partly guaranteed since 1930’s – is not exactly a free market, is it? Recently, the G20 also accused the “reckless excesses” of the banking sector for the mess we are in. While there might be a grain of truth to this, there is also a sense in which these excesses are consistent with the efficiency of markets. If government guarantees are offered gratis to the private sector, competition leads to their fullest exploitation. If regulators legitimize the shadow banking world, then profit-maximizing bankers avoid capital requirements through off-balance sheet transactions. If money is being thrown at insolvent firms without any strings attached, these firms procrastinate on capital issuances and continue paying bonuses and dividends. Hence, compared to 1930’s, the current job of rewriting regulation is tougher. We need to address regulatory failures in addition to market failures. Will we restrict the scope of government sponsored enterprises? Will we stop rebating deposit insurance premiums to banks in good times? Will we bring capital requirements of off-balance sheet activities in line with on-balance sheet ones? Will central bank lines of credit be made contingent on solvency criteria, like the private lines of credit? And will regulatory supervision be held accountable by requiring that they produce public reports on strengths and weaknesses of banks they invigilate? To attribute this crisis to a failure of efficient markets is to miss its most important lesson: That poor regulation, with its incentive and information distortions, can also destabilize markets. 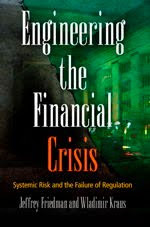 The author is a professor of finance at New York University Stern School of Business and co-editor of the book “Restoring Financial Stability: How to Repair a Failed System.” With Matthew Richardson, he coauthored "Causes of the Financial Crisis" in the special issue of Critical Review devoted to that topic. Nobel laureate Ned Phelps writes : "The lesson the crisis teaches, though it is not yet grasped, is that there is no magic in the market: the expectations underlying asset prices cannot be 'rational' relative to some known and agreed model since there is no such model."